It doesn’t matter if you’re an elite runner logging 120 miles per week or you are training for your first 5k; if you need to run, but have recently become injured to the point where it hurts too much to run, it can be physically and emotionally hard to deal with. Unfortunately, getting injured also very common. Respected bio-mechanics expert Jay Dicharry estimates that 82% of runners will get injured at some point in their running career. If you follow Brad Beer’s 5 tricks to running pain free, you have a better chance of staying healthy, but most of us will mess up at some point. It’s likely to happen to you. Experts suggest that 85% of you reading this article are likely to get injured, if you want to maintain fitness while injured from running, and you are looking for a good cardio replacement for running, it is time to start considering aqua jogging or pool running as it is otherwise known. Will aqua jogging help me recover? Yes, one of the aqua jogging benefits are that it will allow your body to focus on healing your injury while you still maintain your fitness. Recent research has found that pool running is the most effective type of cross training for runners, and if after listening to this podcast episode about running through pain, and you decide it is time to stop running, you will not actually lose as much fitness as you think. Today we will go over what is aqua jogging going to do for you, why running in the pool is good for runners, and I will give you 7 pool running workouts for injured runners that will make you work just as hard, if not harder, than you would while running on land! Ready to make your heart feel like it is going to explode? Don’t worry, it won’t actually explode, but let’s dive in. What is Aqua Jogging and Why is it Different to Pool Running? Well, actually, there isn’t a difference. Aqua jogging has many names that you may hear us use interchangeably throughout this post, as there is no one set name. Aqua jogging, pool running, deep water running, water jogging….need we go on? Aqua jogging involves running in the deep end of the pool, and it has many benefits as it closely mimics the actual running movement. Your feet don’t actually touch the bottom of the pool, so it is zero impact and safe for almost any type of injury, especially if you have a high risk stress fracture, and will be out for a while. In my experience, the only time to avoid aqua jogging is when you have a hip flexor injury, which can be aggravated by the increased resistance of the water as you bring your leg up. Because aqua jogging closely mimics natural running form, it provides a neuromuscular workout that, in addition to aerobic benefits, helps keep the running specific muscles active. The same can’t be said for biking and swimming. The only disadvantage of aqua jogging is that you need a pool that is deep enough to run in without touching the bottom. If you’re lucky enough to have access to a pool of this size, aqua jogging should be your first cross training choice. Good aqua jogging form should imitate your running style fairly closely. You’ll want to get into the deep end of the pool and use an aqua jogging belt if you’re a beginner or not a good swimmer. 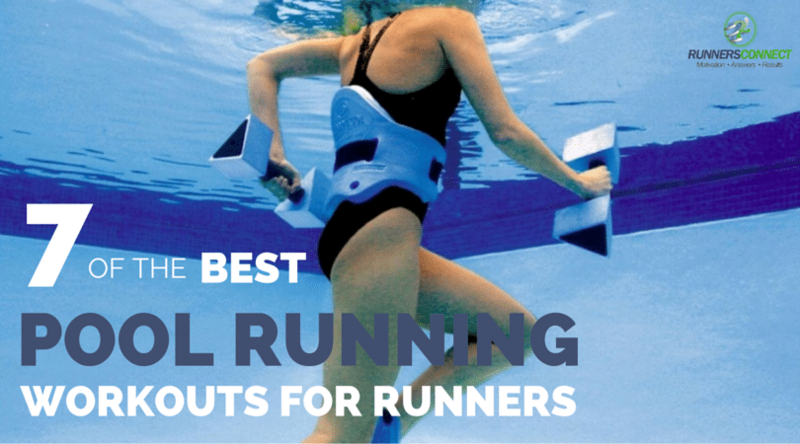 The pool running belt is helpful, but once you get the form down, it isn’t necessary. The key to good aqua jogging form is to keep your upper body straight and to not lean forward too much, which is a little different than your normal running posture. You should practice using a higher knee lift and a more compact back kick compared to running on dry land. This will allow you to remain upright and also enable you to perform harder sprinting activities. If you need more advice on how to pool run properly, expert Lynda Huey explains how to train like an olympian in the pool (she should know, she works with them while they are injured and creates aqua jogging workouts for elite runners). Why is Pool Running the Best Cross Training Exercise for Runners? Studies have shown that aqua jogging can enable a well-trained runner to maintain running fitness for up to 4-6 weeks. In one study, a group of ten runners trained exclusively with deep water running for four weeks and compared 5km race times pre deep water running and post deep water running. The researchers found no statistical difference in 5k time or other markers for performance, such as submaximal oxygen consumption or lactate threshold. In a second study, researchers measured the effects of aqua jogging over a six week period. This time, 16 runners were separated into two groups – one who did aqua jogging workouts and the other who did over land running. Using the same training intensities and durations, the researchers found no difference between the groups in maximal blood glucose, blood lactate, and body composition. Research has also demonstrated that aqua jogging can be used as a recovery tool to facilitate the repair of damaged muscles after hard workouts. These findings make aqua jogging an important recovery tool in addition to being the best cross training method for injuries. The calories burned aqua jogging are even higher than running on land, so if you want to avoid weight gain while you take time off from running, this is definitely the exercise for you! Before we get started with specific workouts, it’s important to realize that elevating your heart rate in the pool will be more difficult than on dry land. Since your cells are 65-95% water, blood circulates better when submerged, which means your heart does not need to pump as hard to circulate oxygen. So, the benefits from pool running must come from a constant, steady effort or intervals. Easy pool running should only be used as warm-up for harder aqua jogging workouts, a recovery tool between hard workouts, or to simulate longer training runs. You can perform easy pool running just like you would perform easy running on dry land, there is nothing fancy about it. You should try to maintain a heart rate that is 65-75% of your maximum heart rate. One of the difficulties of cross training is replicating those truly lung-busting, difficult workouts. With the pool, I’ve actually found a very nice trick to help make pool running as hard as any track workout you might do. If you’re going to be pool running quite a bit due to injury or limited training volume, invest in a bungee cord designed for sprinters. Lynda Huey, our pool running expert believes all runners should use bungee cords to get the best workouts possible in the pool. Lynda explains how to use a bungee cord in detail, and uses images if this description confuses you! Tie one end of the resistance band to a sturdy object (pole, lifeguard stand, pool ladder) and bring the other into the water with you. Put the strap around your waist and begin aqua jog away from your starting point. You’ll begin to notice the bungee tighten and resist against you (depending on the length of your pool, you may need to wrap the bungee around the supporting object or tie it in knots to make it shorter to feel resistance). Spend a few moments testing yourself to see how far you can pull the bungee. This is a great challenge and a fun way to compete with yourself during an otherwise boring cross training activity. Pick a point on the pool wall or side of the pool that you feel stretches the bungee to a very hard sprint that you could maintain for 60-90 seconds. This will be your “sprint” marker that you’ll use on sprint intervals (95-100% of maximum heart rate or all out sprint). Find a point that feels like the end of a hard tempo run. Mark this spot as your “medium” interval distance. When you complete the hard workouts, you can use these reference points to ensure that you maintain a very hard effort. I guarantee that with the bungee, you’ll get your heart rate through the roof. You can challenge yourself and make aqua jogging more fun by seeing how long you can stay at your maximum stretched distance or seeing how far you can push it. Likewise, if you have a friend who is injured (or someone willing to be a good sport) you can try pulling each other across the pool for some competitive fun. Cross training can be tough, especially when you’re injured or want to be increasing your volume faster. This podcast episode about cross training while injured might be something to keep you sane on those days you are alone in the pool, especially if you can invest in some waterproof headphones! 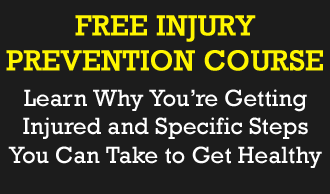 However, I hope that providing a variety of workouts, a fun challenge in the pool, and a little science about the benefits of aqua jogging will help you emerge from your injury with minimal fitness loss. We even found that you can race well after time off from injury! Had to take some time off recently? Download our one-of-a-kind Performance Decline Calculator to find out what your estimated performance decline would be for any race distance in your members-only download section. Thank you so much for this reassuring article. I was diagnosed yesterday with a stress reaction in my 4th metatarsal and really don’t want to lose my good fitness. I’m headed to the pool now to do one of the medium workouts in this article, and will do one of the hard ones tomorrow. Good aftrnoon, my personal trainer sent me the link to your website. I am a former marathoner now not after hip replacement surgery. Can water running be a good alternative fr someone like me? Just strained my soleus (personal diagnosis) and I’m 5 weeks away from a marathon where I’ve been hoping to BQ. I don’t think it’s a terrible strain, but I’m supposed to do a fast finish 20 miles this weekend and that seems like a lot to ask of an iffy soleus. Suggestions for doing this in the pool? Do I just go for the 3 hours the 20 miles would take me at my long run pace, increasing effort for the 4 fast finish miles? Any advice to help me get to this marathon and keep my BQ pacd ability that I’ve spend the last 12 weeks working on would be much appreciated!!!! Hi Chelsea, sorry to hear about your soleus. I have actually done that myself in the past, and I am glad to hear that you are being smart with it. I did pool running in the build up to my race (had to take a full month off running), and ended up racing very well at the end of it, so it works, as long as you make sure you are doing it correctly. I recommend you listen to this podcast episode on Cross Training https://runnersconnect.net/crosstrain which will give you more information on how to do it, and why it is important (and should give you confidence in your race). I would pool running or use a combination of cross training for the 3 hours this weekend, and yes, make the effort more intense the last 4 miles. Remember you will need to keep reminding yourself to keep that intensity up, as it is easy to slack in the pool. Hope this helps! Best of luck! I was diagnosed with runner’s knee (IT Band issues with a terrible pain point at my knee). I have been training for a marathon which is on October 4th. My last run I couldn’t make it more than 4 miles without excruciating pain, and I was supposed to be doing a 20-mile training run. My doctor recommended aqua jogging from now until the race, and a cortisone shot to get me through. Has anyone experienced this kind of injury/pain and been able to complete their long run/race because of aqua jogging? Do you think this would be helpful for high hamstring tendinopathy?